Real beauty is understated and confident. It effortlessly touches us like a gentle breeze. Papilio Ulysses V3 Playing Cards (printed by US Playing Card Company) encourages all who hold this amazing deck to experience its beauty and "Alis volat propriis" - Fly with your own wings. When in flight, the female Ulysses butterfly can be seen hundreds of meters away as sudden bright blue flashes. In honor of this phenomenon, metallic blue and gold ink is strategically speckled throughout the deck: on the tuck case, card backs, court cards and Jokers. 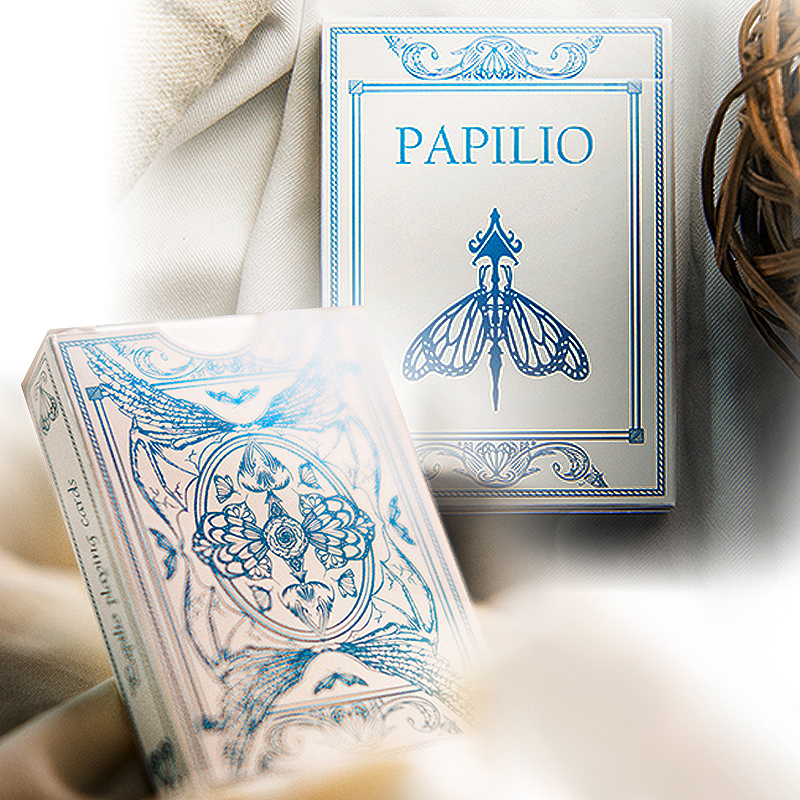 The value and quality of Papilio Ulysses Playing Cards is undeniable. Every card was thoughtfully modified to represent the stages of metamorphosis and flight. Each of the court cards are customized with royal beauty and class. The numbered cards delightfully include a customized pip, while retaining the familiar design of the key indices. The simple white and metallic blue tuck case cocoons the beauty and the unique color of the deck inside. The tuck also fittingly includes a prediction element for magicians. - Printed by USPCC. - Metallic inks on court cards, Jokers, and tuck box. - Special pip on each numbered card. - Customized court cards. - Includes 2 Jokers and one double back. - Designed by Kiran Kuruvithadam. • The cards are poker size. Αυτό το προϊόν προστέθηκε στον κατάλογό μας την Friday 12 January, 2018.